I was out late last week scouting some corn fields and checking some black cutworm moth monitoring traps. Fortunately, the number of black cutworm moths in the traps have been rather low. I did notice some very minimal black cutworm damage in one field. This does not mean growers should let their guard down. Pennsylvania and other northern states have been reporting large flights of black cutworm moths. It is recommended that growers continue to scout corn fields for damage. Remember many Bt hybrids are not that strong against black cutworm. This leaves scouting and rescue treatments as the most viable option for managing black cutworm. I was out scouting some wheat fields in Burlington County today. In general the fields looked in good shape and there were no major concerns. I did see some rather low numbers of cereal leaf beetle larvae in one field. The larva numbers were well below threshold. We need to keep an eye on fields for larval damage, especially when we are in the flag leaf stage. Most growers are familiar with walking through a wheat field and getting little black dots across their pants. Those little black dots are from the larvae of the cereal leaf beetle. The larvae will eat long strips of green tissue between the leaf veins and give the plant a skeletonized appearance. 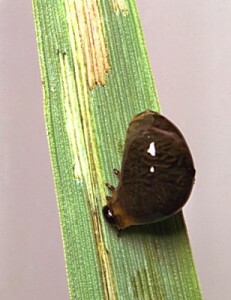 Yield reductions of 10 to 20 % are not uncommon in infested fields. Scouting and control information can be found in the Mid Atlantic Pest Management Guide for Field Crops (EB No. 237). We received a report from extension in Delaware that an adult Kudzu bug was found in a trap in Sussex County, Delaware near a kudzu patch. This should serve as a reminder that kudzu bug is fast approaching New Jersey. This rather new pest is something our soybean industry needs to keep a watchful eye on. You may have first read in different farming publications about the presence of bean platasipid (Megacopta cribraria) or more commonly the kudzu bug in the southeastern US. 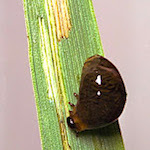 The kudzu bug has begun its migration north, having been found in Sussex county Delaware last year also. The recent find suggests that it can overwinter in southern Delaware. 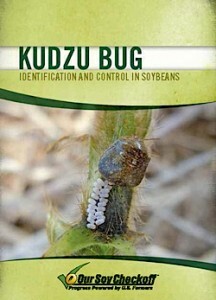 Kudzu bug is not only a pest of kudzu, but also soybean. With the cold winter we have experienced this year, one of the first questions our growers are asking is what will the effect of the cold temperatures be on insect populations this spring. Unfortunately, as with many insect questions there is no easy answer. In some cases the colder temperatures will likely reduce populations of certain pests. Insects in the soil or under snow cover will have protection from extreme temperatures which will influence survival. Many insects migrate in over the spring from the south, so they were not here to experience our winter weather. Survival conditions for migratory insects are more dependent on their local over wintering conditions. It is difficult to generalize about the impact of cold temperatures on the crop pests we battle. There are influences of fall tillage, soil characteristics, snow cover and soil temperature that play a role. The bottom line is that our cold winter weather will not relieve you of your scouting duties. Get out in the field on a regular basis and see what is going on, talk to others to find out what they are seeing, and check back with the Plant and Pest Advisory for updates through the season. If you are aware of any fields in the southern portion of the state (particularly in Salem, Cumberland and Cape May) that has kudzu please contact me by e-mail @ bamka@njaes.rutgers.edu. As you may have heard the kudzu bug is knocking on New Jersey’s door. In July of 2013 the kudzu bug was found in Sussex County Delaware, just a relatively small trip across the Delaware Bay from New Jersey. This rather new pest is something our soybean industry needs to keep a watchful eye on. You may have read in different farming publications about the presence of bean platasipid (Megacopta cribraria) or more commonly the kudzu bug in the southeastern US. It is referred to as the kudzu bug because it has a tendency to feed on kudzu. Feeding on kudzu has not been viewed as a bad thing in the south. 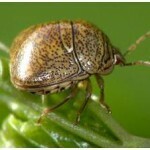 However, in the southeastern US kudzu bug has become a concern because it is also a pest of soybeans.